If you have an older drill with a chuck that requires a key for loosening and tightening, there are a few reasons why you might want to replace it with a keyless chuck. For one, the key can wear out and, for another, you may lose the key altogether. The reasons could also be that you simply prefer the convenience of a keyless chuck or you need a chuck that handles bits with larger shanks. Whatever the reason, the procedure is simple, although it varies depending on whether the spindle on the drill is threaded or tapered. 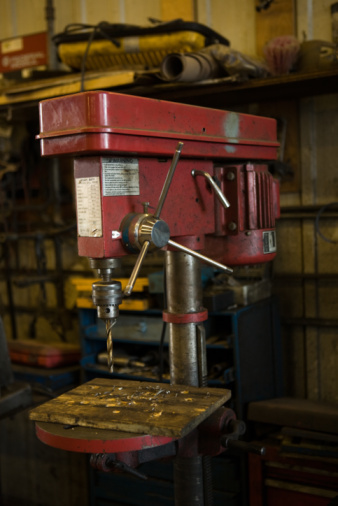 Threaded spindles are more common than tapered ones, which you are likely to find only on older drills. A chuck that fits on a threaded spindle has a model number that contains the letters "B" or "BA." If you don't see these letters, the chuck is held onto the spindle by friction, and you'll need removal wedges to get it off. Purchase these when you purchase the replacement chuck. Before you begin removing the old chuck, be sure to unplug the drill or remove the battery. Open the chuck as wide as it will go, and look down the throat with a flashlight to determine whether you need a screwdriver or an Allen wrench to remove the chuck screw. Insert a screwdriver or Allen wrench into the open chuck until it contacts the chuck screw. The screw has reverse threads, so you have to turn it clockwise to loosen it. Pull it out of the chuck and set it aside. If the chuck has a threaded spindle, insert the short end of a 1/4-inch or larger hex wrench into the chuck and tighten the chuck to hold it securely. Tap the other end of the wrench with a rubber mallet to loosen the chuck. The chuck threads are not reverse, so you want to turn the chuck counterclockwise to loosen it. Once it's loose, you should be able to unscrew and remove it by hand. Older drills often have tapered spindles To get the chuck off of one of these, insert removal wedges between the base of the chuck and the drill arbor from opposite sides, much in the same way you insert shims behind a door jamb. Tap the end of one of the wedges with a regular steel hammer. The shock should loosen the chuck so you can lift it off. If the spindle is threaded, screw the chuck clockwise onto the threaded shaft and tighten it by hand as far as it will go. Open the jaws, insert the chuck screw and tighten it by turning it counterclockwise. Insert a bit and test the drill. If the chuck wobbles, tighten it and tighten the screw. The procedure for mounting a chuck on a tapered spindle is is a little different. Clean the spindle with alcohol or lacquer thinner to remove all grease and dirt. Set the drill on a table with the spindle hanging over the edge and brace the drill with a clamp. If you have a vise, put the drill in the vise. Set the chuck on the spindle and hold a small piece of wood on the end so it's in contact with the chuck. Tap the wood with a hammer to force the chuck onto the spindle.